Me in November, 2017. A no-make up selfie - something I never thought I'd do. Disclaimer: This post contains a few affiliate links, which means YBC® will earn a small commission if you happen to make a purchase through the link. Also, aside from running all the photos through the same filter so they'd all have the same lighting for comparison purposes, these photos aren't edited. 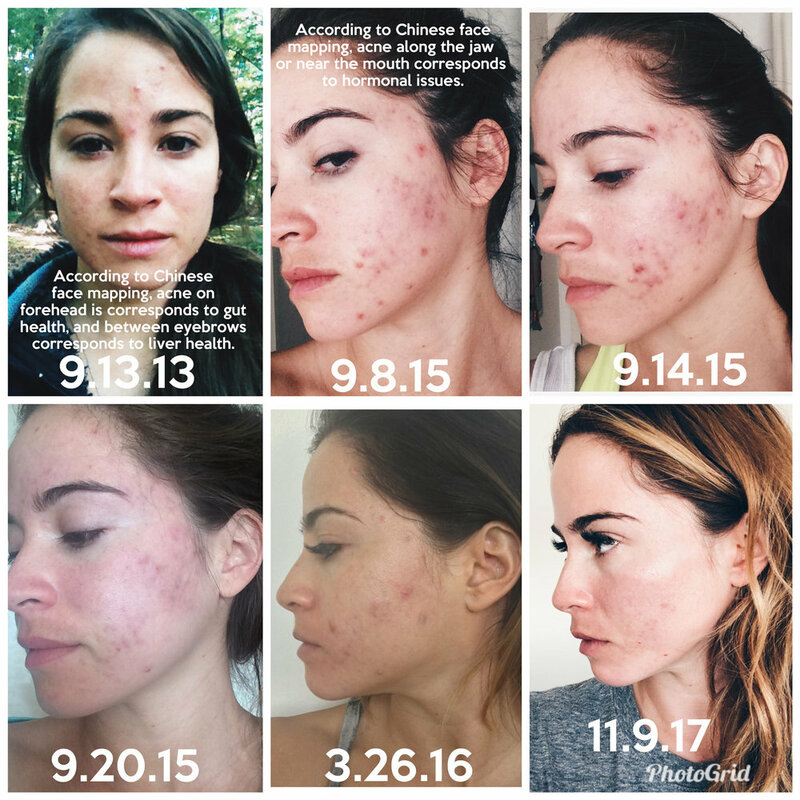 My skin isn't perfect now by any means, but since I've learned so much about nutrition and gut health on my journey to clearer skin, I thought I'd share my experience here in the hopes that it'd be helpful to other people out there dealing with acne. Remember that I'm not a licensed professional and am not able to say what will or will not help you. Maybe something I did will help, maybe not. Everyone's body is different. But I'm hoping that this post may inspire someone out there. Also, I think it's important to note that I come from the school of thought that basically believes your skin is telling you what's going on inside your body. I don't believe any topical skincare product out there will cure acne. Based on my own research, I believe that most acute acne is caused from some sort of internal imbalance. When I went off the antibiotics, approximately a year and half or so later, my skin was good for about a year, but then, overnight it seems, it just went haywire. I'm not talking about the occasional pimple here or there, I am talking about massive cystic acne. It began on the forehead. I talk extensively about my experience in my book Namaslay, but essentially I went down a rabbit hole trying to figure out how to cure acne, and I thought it was curious - it wasn't like my entire face had broken out, just my forehead and in between my eyebrows. I somehow stumbled upon Chinese Face Mapping, which hails from Chinese medicine. Basically, it says that the location of your breakout corresponds to somewhere inside your body that is experiencing an imbalance. There are variations in the maps, but it seemed like an overwhelming number of them claimed forehead breakouts corresponded to gut health and digestion, and in between the eyebrows corresponded to the liver. I found this fascinating because at the exact same time that I was experiencing these forehead breakouts, I was experiencing painful bloating pretty much any time I ate. I mean, I honestly looked like I was in my third trimester - that's how bloated I was. Then I considered how antibiotics (and pretty much every pill we pop) needs to be filtered through the liver, and since I'd been on antibiotics for so long - whew! My liver must be taxed. No wonder I was breaking out between the eyebrows....I mean, right?! I don't know. I was partially skeptical, but couldn't deny that all the puzzle pieces were coming together. All of this lead me to discovering the book Gut and Psychology Syndrome, in which I learned the extent of the damage that antibiotics do to our gut health, and, thankfully, what to do about it. I started the GAPS diet (here's my 1 year update and 2 year update), and decided I needed two years of the diet since my gut was pretty destroyed. So I started the GAPS diet on Oct 1, 2013. I remember that date very distinctly because that winter was the first winter in fifteen years that I did not experience Seasonal Affect Disorder (seasonal depression). The book talks about how gut health is also related to depression and anxiety (both things I'd also struggled with for years), and I was blown away that my seasonal depression was no longer a thing! I also noticed other improvements. While antibiotics had rid me of 21 of 22 symptoms I had for Lyme Disease, I still had lingering joint pain and inflammation. The GAPS diet cured that. Completely. In addition, my hair grew thicker and looked more vibrant, my nails hardened and weren't so brittle, and my brain fog went away completely. I felt like a whole new person for a few months. The forehead acne went away, but in about two year's time, pretty much at the end of the GAPS diet (you're only meant to be on it for a max time of two years), I developed breakouts around my jawline. I was devastated. As anyone with acne knows, it's just so frustrating. Your face is the first thing people see, and I felt like a fraud because by this point, I was teaching yoga and telling everyone I knew about all the health stuff I'd learned, yet my skin was a complete wreck. I felt like the acne was a symbol of how unhealthy I was internally, and I was just really, really down. This also came at a time of major international travel, with very disrupted sleep, strange foods, and odd schedules. In four weeks I'd flown from New York to London to Greece to Morocco, and back to New York again doing workshops and retreats and being "on" with people, which is just emotionally and physically draining for me. I was slated to do a workshop in Utah and I had a breakdown upon my return from the big trip. I was overwhelmed, overworked and my body was giving out on me. I was feeling depressed because of all of that, and then, of course, there was my skin that was just erupting all along my cheek and jaw. In the midst of all that, I was dealing with some marital issues, and, well, let's just say I was completely stressed to the max. I cancelled the Utah retreat, wrote a post telling people I needed to take a break, and then I logged off, shut down my computer, and went hiking with my mom and Buckles. In that time, I also began researching. I started talking with friends of mine who'd done the GAPS diet for Lyme Disease (when you live in Connecticut, it's pretty much a given that you know a handful of people or more who have had Lyme). Each of my friends claimed that while the GAPS diet had helped them heal their gut, they were left with hormonal imbalances. I checked with the Chinese Face Maps, and sure enough, a majority of them said that acne on the jaw, cheek or around the mouth was due to hormones. And then a light went off. In thinking of my periods, for my entire life, I have been on a four week cycle, like, to the hour. But in the last few years, my periods had been erratic and would come every two weeks, or every three weeks. I remember asking my cousin, who's an IVF nurse, if that was normal. I thought maybe it was because I'd just turned 30 and I was, I dunno, getting old. She said it was normal, but in looking back, I think those erratic periods were due to hormonal imbalances. Not only were my periods off, but my breasts would be painfully sore in the week leading up to my period. A little soreness is normal, but this was abnormal soreness, bordering on pain (I remember grimacing with each step, as the impact of even the most careful step would hurt my chest). In addition, my breasts would swell right before my period. Again, a little swelling is normal, but I'm talking swelling to what felt like a full cup size or two. And my moods?! Forget about it. I was irate one minute, crying the next, sometimes happy. It was an absolute nightmare being in my body. I felt totally out of whack and out of control. So I started researching how to balance hormones. The first thing I did, was to incorporate more grains. If you do a google search on the Paleo diet and women's hormones, there is some evidence that suggests that for some women (not all!) too much fat in the diet can throw off hormones. I was used to eating a ton of fat because that's what's prescribed with the GAPS diet, but I decided maybe it was time to try some easy to digest grains and try to get my energy that way, instead of trying to get the majority of my energy from fat. Perhaps fat was throwing my system off. I started adding sprouted grains into my diet, overnight steel cut oats, etc. Within a few weeks, I felt so much better. I had a stronger recovery time at the gym, and my moods were evening out quite a bit. But my skin still wasn't great, so I kept researching. I'd read that tracking macros is a way to balance hormones, so I started dialing it in with my diet. I was concerned with limiting the amount of fat in my diet - not because it's bad for you (it's not, if it's a good quality fat! ), but because I think excessive fat in my diet may have been throwing off my hormones) and focusing on getting in the appropriate amount of carbs. In really focusing on hitting my numbers, I noticed that my skin improved a bit (still not great, though), and my sleep improved. I had much more energy, and my periods became slightly more regular (about every 3 - 3.5 weeks...but remember, I'd been on a 4 week cycle for my entire life, so I still felt like there was room for improvement). My breasts stopped feeling so unbearably sore before my periods, and stopped swelling as badly as they had been. But my skin still wasn't great. After this summer's thirty day trip which took me from New York to London to Greece to Dubai to Kenya and back to New York again, my skin really took a toll. I came home and my skin was wrecked. Like, to the point that I didn't want to leave the house. Interestingly, though, it was pretty much only breaking out along the cheek, jaw, and around my mouth. So I went to a dermatologist. I was done with trying to follow diets. I just needed a quick cure. niacinaminde - basically one of the B vitamins that is found in turkey, chicken breast, mushrooms, liver, tuna, green peas, and grass fed beef. zinc - zinc is needed for immune function, and has wound-healing properties and is vital for thyroid function and also helps to control inflammation. It's found in beef, spinach, pumpkin seeds, lamb and mushrooms. folate - found in spinach, asparagus, broccoli, brussel sprouts, oranges. copper - helps hemoglobin and collagen and is found in beef liver, sunflower seeds, lentils, almonds. selenium - crucial to stabilizing mood and inflammation - found in brazil nuts, halibut, grass fed beef. chromium - helps with blood sugar and brain health, among other things - found in broccoli, grapes, potatoes, garlic, basil, oranges, turkey, apples and bananas. What was so fascinating to me about this list, is that I'd recently read The Micronutrient Miracle. In it, there is a self-test you can take that will give you a rough idea of which micronutrients you're deficient in, and seriously every single one of the above had come up for me! So once again, the pieces of the puzzle were coming together. The tough part, though, is that knowing what I now know about gut health, I knew that seeds and raw vegetables are tough for our bodies to digest unless they are sprouted or cooked, and even then, they need to be ingested in small doses or you run the risk of taxing the digestive tract to the point that it makes you deficient in other micronutrients because it's working so hard. Ugh, could I just catch a break?! Essentially, this all meant that there was no quick fix. I'd have to slowly start incorporating these foods and just wait and see. So, at the dermatologist, I took her list of micronutrients, and went on my merry way. That was about three months ago or so, and in that time, I have made a conscious effort to continue to hit my macro numbers (ie making sure I don't eat too much fat, and ensuring that I hit my carbs numbers so I can keep up my energy), while also making a concerted effort to vary my foods and get those micronutrients in - especially the ones I'm deficient in. I started incorporating Go Raw sprouted "cookies", which contain sprouted sunflower seeds. I started eating mushrooms even though I freaking hate the texture more than anything! I started incorporating spinach into my breakfasts, and eating pumpkin seeds every now and then. I really focused on varying all my foods. In addition, I've made an effort to actively be happier. This sounds cheesy, but as is explained in The Gratitude Diaries, being grateful has a direct impact on stress levels and cortisol (which deals with inflammation levels in the body). I keep a gratitude journal (more on that in an upcoming post soon), and every time I walk my dog, I literally do not pass one person without thinking to myself, "I wish you happiness." It might sound bizarre, but the amount of happiness it gives me to actively wish those I pass happiness directly impacts how good my day is. Further, I've been more cognizant of getting quality sleep. I try to sleep for at least seven or eight hours, and make sure those hours consist of deep, undisturbed sleep. I've learned that our bodies need sleep to physically repair, which is why our inflammation levels are usually at their lowest when we first wake up in the morning. In addition, I'm still being mindful of gut health. I try to have a mushroom elixir every other day or so, and still take a fantastic probiotic. I drink bone broth daily. All this being said, I'm not super crazy about it. All these things are in the back of my mind, but if I go to a birthday party and there's cake, I'm going to have a small slice of cake and love each and every bite. I don't believe in depriving myself, but I believe in moderation. I think it's a healthier choice to just eat and enjoy, than eat and feel guilty, or deprive myself and feel left out. If I don't get a workout in, or I don't get great sleep one night, I don't obsess over it. Getting off track once or twice in a week is not going to ruin all the hard work I've put into healing, you know? On top of that, I've eliminated people and things in my life that are a constant source of stress. I say no a lot more to things I don't want to do, and try to maintain a better work/life balance. Essentially, I'm just trying to lower stress and be gentle on myself. Me, November 2017, no-make up.